Philadelphia Flyers defenseman Ivan Provorov celebrates his second-period goal with his teammates. One of the most maddening seasons in recent team history looks like it will provide at least one more maddening game — and hopefully more – after the Flyers came back to beat the visiting Carolina Hurricanes, 4-3, Thursday night. The game marked the return after two months of goaltender Brian “Moose” Elliott, who played for the first time since Feb. 10 after undergoing core muscle surgery. Elliott was admittedly rusty after the layoff, but he did make 19 saves on 22 shots, and Claude Giroux continued to show why he’s among the NHL’s best players, scoring his career-best 31st goal. 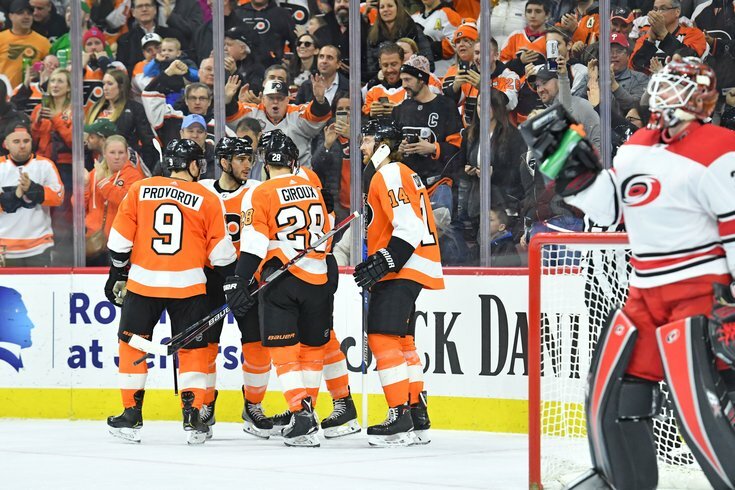 Jake Voracek supplied the game-winning goal, one that proved to be crucial in his team's attempt to secure a playoff spot as it allowed the Flyers to maintain control of their own destiny. It comes down to this, and it’s very simple: If the Flyers earn at least one point against the visiting New York Rangers in the season finale at the Well Fargo Center (3 p.m. Saturday), they clinch a playoff berth. The Flyers (41-26-14) currently hold the final Eastern Conference wild card spot with 96 points, four points ahead of Florida, which sits at 42-30-8 and has a game in hand. If the Flyers lose to the Rangers in regulation on Saturday, and Florida wins its last two games – they play Buffalo, which has the worst record in the East, and Boston, the team they beat on Thursday night to keep pace with the Flyers – then the Panthers are in the playoffs as owner of the tiebreaker (total wins). It’s a scenario Flyers coach Dave Hakstol doesn’t want to think about. Right now, it’s about controlling what his team can do — and that’s winning on Saturday to clinch a playoff berth for the first time since the 2015-16 season. Having Elliott back is certainly a factor working in the Flyers’ favor. And in a critical game, Hakstol was willing to risk any rust the goalie may have accumulated in his nearly two-month absence. "[Elliott] was ready to go. He’s worked to put himself in that position, and he’s our guy,” Hakstol said. “He’s a big reason why we continue to be in control of our own destiny. That’s nothing against Petr Mrazek or Alex Lyon. Petr has done a hell of a job for us, and he’s also a reason why we’re in a situation where we continue to control our own destiny in terms of the playoffs. Meanwhile, Giroux has quietly had his best season — and continues to be the city’s most under-appreciated superstar, in addition to being its longest-tenured athlete. With his third-period goal, Giroux extended his scoring streak to nine games, giving him five goals and 10 assists during this stretch and placing him two points away from his first 100-point season. His 98 points (31 goals, 67 assists) are tied with Tampa Bay’s Nikita Kucherov for second in the NHL in scoring. Midway through the third period, the Flyers faithful inside the Wells Fargo Center began chanting "MVP! MVP! MVP!" during a break in the action as the JumboTron showed a montage of great Giroux plays. “I’ll be honest, I didn’t hear [the MVP chants],” said Giroux, allowing a smile to crack his normally stoic face. “We plan on playing our best hockey against New York on Saturday. We know what is at stake, and tonight we grinded. I think everyone is doing their job, and doing what they’re best at, and when everyone does that, we get wins.